The directions are so simple and would be great for anyone at any baking level. Overall this recipe is quick and easy and I shall mark it off as a go to cookie. 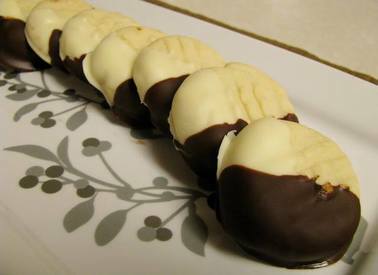 The idea of a dipped cookie that includes one part semisweet chocolate and one part white chocolate is so simple. It gave such a rich chocolaty flavor and definitely a fancy look.The ingredients and enhancements created a crunchy, melt in your mouth texture with a sweet sugar cookie flavor.